The D2W product range has been developed to degrade totally and harmlessly - even if improperly discarded as litter - to leave nothing more than water carbon dioxide and a very small amount of biomass. Approx size: 178mm x 295mm x 365mm.The 178mm relates to the width of the bag, the 295mm is the height without handles and the 365mm is the height including the handles. 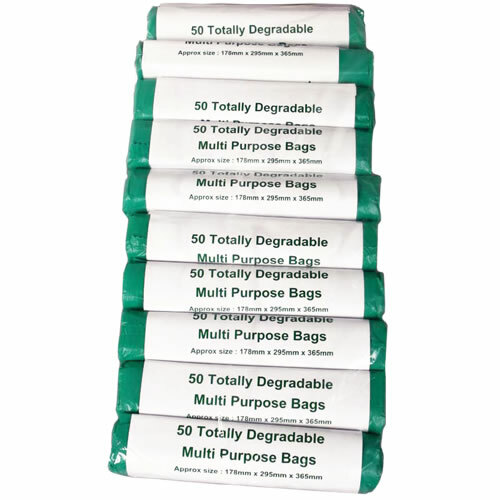 There are currently no questions to display about d2w Multi Purpose Degradable Bags - 4L - Pack of 50. D2W biodegradable plastic bags are made out of environmentally-responsible oxo-bio plastic which can be re-used and recycled. They are safe for foods, contain no heavy metals and have been tested and approved for their eco-toxicity. This UK based company are plastic specialists and have developed an oxo-bio plastic that will degrade and disappear in a short timescale, leaving no fragments, no methane, and no harmful residues. These eco-friendly plastic bags look like conventional plastic bags, but contain a small amount of a special D2W additive in the standard plastic polymer, resulting in something called 'controlled life' plastic. This biodegradable plastic will last for just 18 months before the polymer breaks down and the molecules biodegrade to become oxygen and water. An ideal choice for the eco household with a concern for the future.